There is a temptation to do as much of any particular home improvement yourself, but DIY for complex projects, even those such as “budget conservatories”, could be a path that is full of good intentions – and we know where that can lead. Disaster could be lurking around the corner and here are a “10 reasons why” DIY conservatories can cost more in the long run. Experience – if you don’t have extensive trade skills don’t even think about it. Costs – fully fitted conservatory prices from a suitable company are controlled. Budgeting the DIY work may sound simple, but if you don’t have the ability or knowledge of how to buy your materials at trade prices it the costs could easily escalate. Logistics – what do you buy first (or last) where do you store it or even where do you buy it from? Tools & Machinery – if you don’t have the right tools, you are asking for trouble. Saving Money “fever” – you could be tempted to cut corners the get cheaper & lower quality material leading to a poor (or even dangerous) final result. Planning & Building Regulations – Even if you don’t need planning permission, you still have to abide by building regulations. For example, windows & doors need to be certified as compliant. Overlooking things – For example: do you know if you are building over drains & utilities? There are regulations covering these circumstances. Are you thinking of using a simple steel base? What about the ground underneath? Is it going to be able to support the structure long term or sink into the earth after the first (typical British) long wet winter? 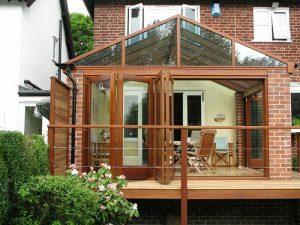 Value – if you plan to sell your home later, is the new room going to make your home more or less “sellable” when you tell the potential buyer about your DIY conservatory? Time – this commodity cannot be valued, it’s truly priceless. Can you 100% commit enough time & effort to see the job through to the end? Whilst you may personally find the initial costs of using a professional are high, a new home extension is a long term investment. Saving money by doing it yourself may seem attractive, but if you spend the next few months (or years) rectifying faults that’s potentially going to cost more.